Boeing's Starliner capsule, which is being developed to take astronauts and cargo to the International Space Station. 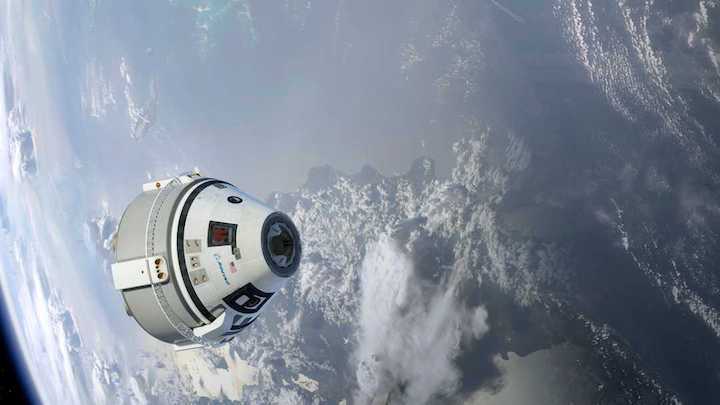 Boeing now hopes to fly astronauts from Cape Canaveral aboard its CST-100 Starliner capsule in the middle of 2019, roughly a half-year slip from previous schedules. The company on Wednesday publicly updated its flight schedule, two days before NASA plans to announce which astronauts will be first to fly to the International Space Station on the Starliner and SpaceX’s Crew Dragon capsule. SpaceX has yet to update its schedule, and it’s not yet clear which company will be ready to fly first under NASA’s Commercial Crew Program. Both companies will fly orbital test flights of their capsules without crews, followed within five or six months — barring any major problems — by tests with two-person crews. Mulholland said a United Launch Alliance Atlas V rocket could launch the Starliner’s uncrewed test flight from Cape Canaveral Air Force Station by the end of this year or in early 2019. Previous schedules showed the uncrewed flight occurring this month, and the crewed test in November. SpaceX’s schedule was similar, with a Falcon 9 rocket launching a Dragon crew in December from Kennedy Space Center's pad 39A. SpaceX's dates are also certain to slip by months. Mulholland said Boeing has pursued an “aggressive and challenging” schedule, but delays are in the nature of development programs designing and testing complex vehicles to fly people safely in space. Boeing astronaut Chris Ferguson, a former space shuttle pilot and commander, tests a spacesuit inside a CST-100 Starliner mockup. An example of the challenges cropped up in June during a test simulating a capsule aborting from a failing rocket. On a test stand in New Mexico, several abort engine valves failed to close properly, causing a leak of toxic fuels. The test article was not damaged and no one was hurt, but the incident required an investigation with support from NASA. Boeing is confident it has resolved the issue, but it has pushed back a full pad abort test to next spring, in between the two orbital flight tests instead of before them. The crewed test flights will be the first launches of astronauts to orbit from U.S. soil since the last shuttle mission in 2011. NASA has relied since then on Russia’s Soyuz spacecraft to carry astronauts to and from the ISS. The space agency will use up its last Soyuz seats by late 2019 or early 2020, so there's a risk it will not be able to reach the ISS if the commercial capsules are not certified as safe for operational missions with four-person crews by then.